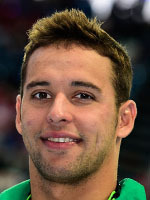 In Rio, Chad Le Clos will enjoy another showdown with his hero-turned-rival Michael Phelps, the record 18-time Olympic champion. The South African and the American legend both picked up butterfly gold at London 2012, with Le Clos triumphing in the 200m race and Phelps in the 100m. Age is certainly on the South African's side: he will be 24 in Rio, Phelps 31. "I'm not afraid of Michael Phelps," insists Le Clos, who is eyeing up a golden double in the butterfly (100 and 200m), and is hoping to break Phelps's world records in both events. Double world champion in the 100m butterfly, Le Clos is expecting sparks to fly: "It's going to be like a heavyweight title fight."